Have a thoroughly apple-themed day at our annual seasonal celebration in and around the Stanmer orchards. The event is FREE and EVERYONE is welcome. Want to be involved? It takes an army of cheery, generous volunteers to make Apple Day Brighton happen. There are many ways to help, from fruit picking and pressing apple juice to serving cider on the day. You can sign up to help on the day here, or sign up to our volunteer mailing list find out about other opportunities to help out before and after the event, plus other volunteering opportunities throughout the year. 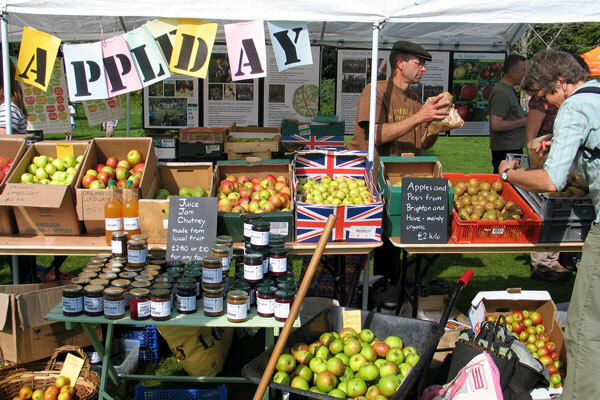 Apple Day Brighton, hosted by Brighton Permaculture Trust, is a harvest celebration that draws thousands of people each year to beautiful Stanmer Park, the heart of our organisation. It’s a village fair style day out for all ages with tours of the orchards, live music, dance and storytelling and entertainment for kids; there’s a fun fair, walks in Stanmer woods and they can have a go at making their own apple juice. You can peruse local craft, book, and produce stalls, see first-hand heritage and environmental sites and projects, and you’ll have the opportunity to enjoy locally produced cider, and a variety of foods from sustainable ethical suppliers. The Fruit Factory is home to the scrumping project, allowing us to process up to 40 tons of unwanted fruit from local gardens and orchards into delicious products while talking to the passing public about what truly local food is all about. Come and have a go at using our traditional press, and watch our team make huge quantities of juice throughout the day with apples from our orchards and scrumped from Brighton & Hove. Enjoy a cup of the freshest pressed juice to quench your thirst. You can peruse Stanmer Preservation Society bookstore and find out what the ancient, and ridiculously deep, Stanmer Donkey wheel was used for. Go on a walking history of tour of Stanmer Orchards and find out why our Sussex apples are so important. Find out how to grow food with minimal effort on a Plot Tour, and check out eco building at the Earthship. See how fish and plants can be growing together in a greenhouse ecosystem at Aquaponics Life or check out our Scything demos in the Home Farm Orchard. Get involved with apple juicing at the Fruit Factory, or visit our bike experts to give your faithful steed a tune up with the Bike Hub and The Bike Tailor. Rio dancing with Marta Scott Dance. We welcome the story of The Three Golden Apples: stories of nature and apples, from the South Downs Storytellers, and Family friendly stories and Apple themed Folklore presented by Fleur Shorthouse. And our own wonderful Polly is running child friendly/seasonal activities, storytelling and songs around a small fire at a special area in our Home Farm orchard – magical. Back again this year are the traditional funfair rides, courtesy of Steve Nutter Old Time Funfair. The delicious line up of local, sustainable, and ethical yummy offerings! These are all served up in compostable food trays so keep your eyes open for our cunningly placed waste bins when you’ve finished – drop it into the right one! ! And Stanmer House will also be offering up a special menu of local and seasonal goodies on the day. Call in to find out what’s on offer. These delicious food options are specially selected to reflect the principles at the heart of Brighton Permaculture Trust’s work to inspire people to choose low emission, and low waste, seasonal local products that promote diversity and resilience in the environment. Have a chat with our vendors if you have chance! We hope for beautiful September weather, and have been lucky these past 12 years! Do check the weather beforehand and bring sunscreen and hats, and umbrellas and boots as needed to enjoy your day to the max. We expect around 8,000 people to the event and so it’s a busy day for traffic around the alternative road system we have in place for pedestrians. Please be patient, watch out for pedestrians, and arrive early to avoid queues! Bring a refillable water bottle. Our food vendors are discouraged from bringing plastic, and a water point is available for re-fills on site. For more information about waste reduction around the city our Waste Station stall has all the most up to date info, call in and see what you can do. Bring a rug. We have some chairs and tables but consider bringing your own blanket or rug to truly relax down and soak up the atmosphere. We provide festival toilets on the day, as well as toilets specifically with baby changing facilities and for those with additional mobility requirements, as well as a block of urinals. Please note that Stanmer House toilets are for their customers only, however there are also the permanent public toilets in Stanmer Village available for use on the day, and a composting toilet up at Stanmer Organics if you go on a plot or Earthship tour! To keep updated as we release more information about Apple Day 2018, follow us on Facebook or Twitter, or sign up to our newsletter. Thanks to our sponsor, Infinity Foods. Brighton Permaculture Trust has received funding for Apple Day Brighton 2018 from Brighton & Hove City Council as part of the Stanmer Park Restoration Project activities plan, which is Heritage Lottery Funded.